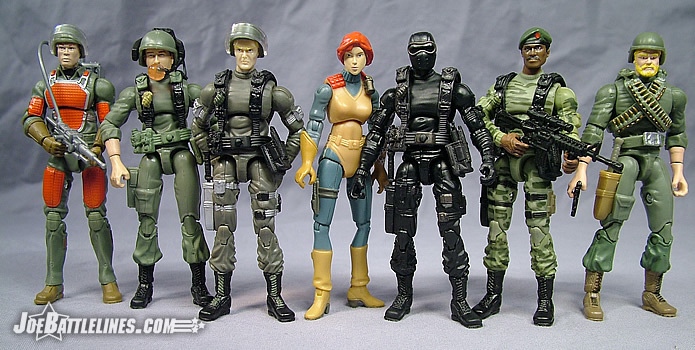 As I’ve stated time and time again, for a certain element of the GIJoe fandom the “original 13” Joes possess a certain mystique that casual fans may find hard to comprehend. After all, what’s so great about a bunch of uniformly dressed guys dressed in olive drab with mostly standard-looking military gear? Where are the neon banana pants? What about the over-sized rocket launchers that would be more at home in HALO 3 than in a modern military toy line? C’mon, where are the Sigma Suits? 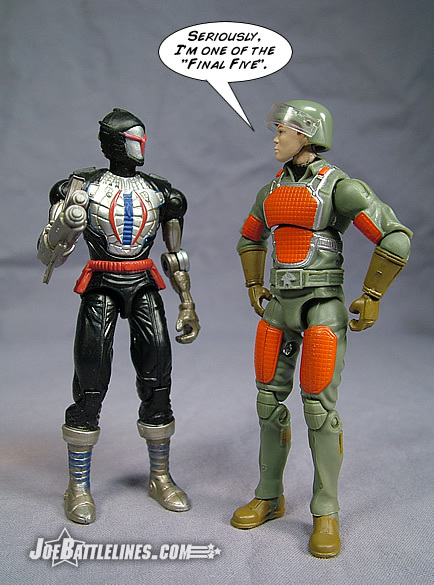 For those of us who started with the concept of “GIJoe: A Real American Hero” back in 1982, there is something magical about that original baker’s dozen specialists who looked the forces of Cobra straight in the eye and didn’t blink. Fortunately for us, the folks at Hasbro also seem to understand that there is a certain appeal held by those debut characters and thus members of that debut roster have been trickling into the 25 th Anniversary line one at a time. 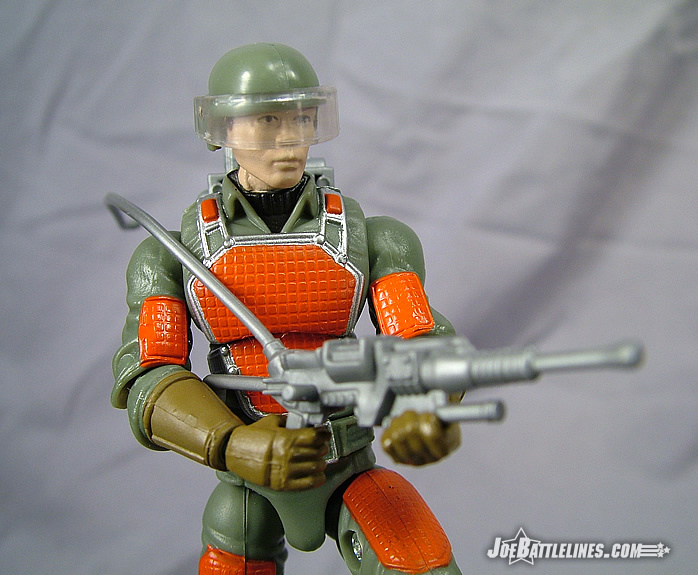 Back in 1982, the concept of a “laser rifle trooper” was positively high-tech. 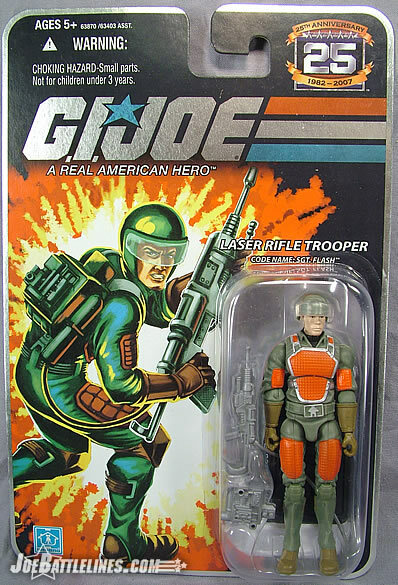 Lasers were the product of science fiction to most minds at that point, so the notion of a military trooper running around with a weapon that produced a super concentrated beam of light was something that belonged more in the Star Wars toy line by Kenner than a military line, right? 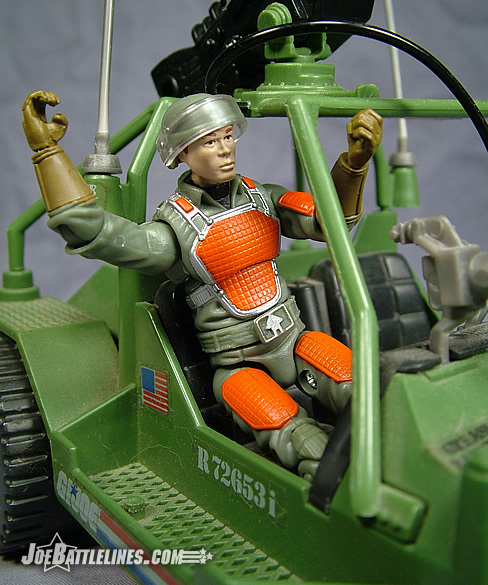 Fortunately for Hasbro, the concept of Flash with his red padded olive drab uniform and his heavy insulated gloves caught on with a generation of young minds and the GIJoe line took off like a rocket. Hasbro really went all out to recreate the original Flash figure with very few alterations. 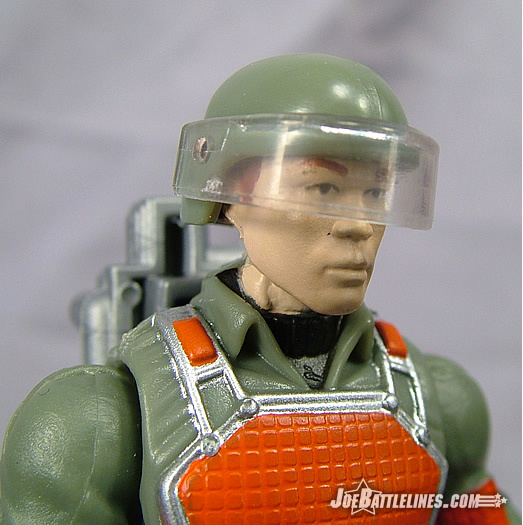 The basic uniform is molded from olive drab plastic with the padded sections painted red with silver trim. The body features some terrific sculpted folds in the “fabric”—especially at the elbows and on the torso near the chest padding. The figure’s gloves, sculpted to resemble thick leather work gloves, are painted brown, as are the “cinches” on the back of his pant legs. A nice deviation from the original figure design is found in the painted black turtle neck protruding from the collar of the figure’s coveralls. 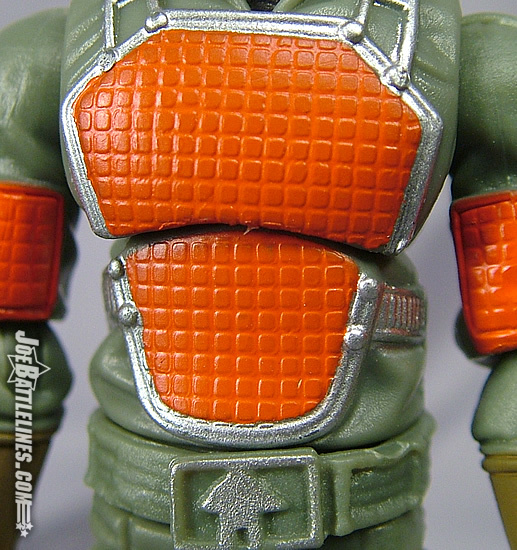 (This would make a perfect torso for the forthcoming Major Bludd figure as opposed to the reuse of the Zartan body.) An added belt accessory sports familiar silver “house” logo that was seen on the original swivel-arm versions of the figures—providing yet another homage to the classic 80’s roots of the character. I’ll be honest- I’m not crazy about the head sculpt used for this figure. It’s not that it’s a bad design in any way, size, shape, or form—it’s just not what I had pictured in my head when I think of Anthony Gambello. The facial expression is a bit stern and the features are a bit “older” than my mental picture. This design works well for my impressions of Grand Slam, who was always a bit older than Flash in my imagination, but for Flash it lacks that certain “snap” that other figure updates have had. It doesn’t help that, unlike characters like Stalker and Scarlett, Flash never had a distinctive appearance that cemented his likeness in the minds of fans. 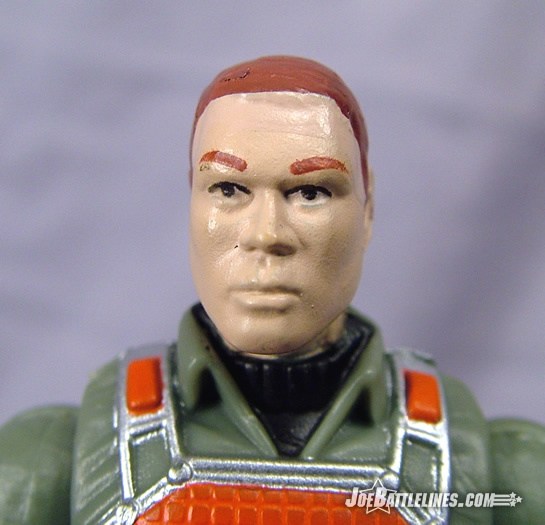 So, while the head sculpt isn’t entirely to my liking, the close-cropped hair and serious expression work well for a man who was on the cutting edge of counter-terrorism and military technology back in 1982. It’s impossible to talk about Flash without discussing the weapon that made him so distinctive back in the early 1980’s. Hasbro once again went all out in recreating the character’s classic gear—with a few small changes. The laser rifle, while stylistically similar to the original design, is much bulkier, particularly in the stock of the weapon. It appears as more of a “rugged prototype” than a “fragile piece of equipment” and is something that I could actually see as a conceivable prototype some day. 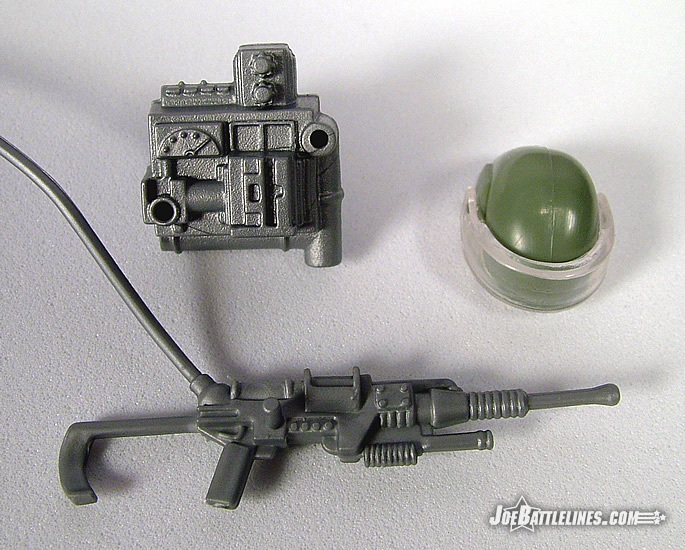 As with the original version, the rifle is connected by a molded plastic “hose” to a port on the figure’s backpack. The small “plug” at the end of the hose is designed to fit into one of the ports on the small portable power unit that is placed on Flash’s back. I’ll be blunt- the fit isn’t great. I had to shave the plug down a bit with a pocket knife to get it to fit snugly and even then the plastic hose is showing some signs of stress from having been forced into a very tight fit. I’ll probably just cut the hose off entirely and replace it with a piece of tubing similar to that found on many classic ARAH-era figures as well as included with the 25A Dreadnok Ripper. Flash’s backpack will look familiar to many collectors of the line as it is the same piece that was included with the Comic Pack #14 Breaker figure. (The backpack debuted with Flash but as this review is being rewritten after Breaker’s I’m including the reference here.) The unit features some nice detail in the sculpting including some knobs and a power meter of some sort. 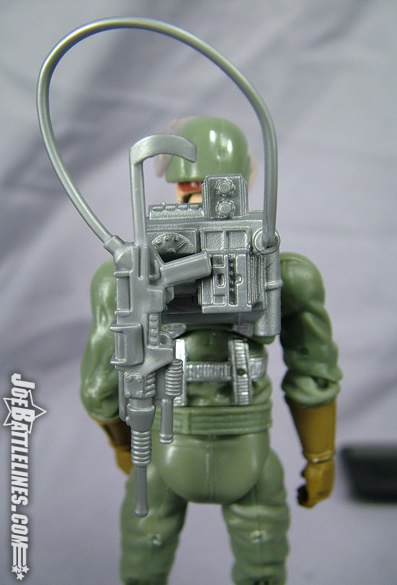 The backpack also serves a dual purpose as an additional sculpted port mates with a post on the side of the rifle to allow Flash to sling his weapon onto his back when not in use. It’s a fantastic extra detail that was never found on the original figure and one that just enhances my enjoyment of this figure more and more. It’s hard to be objective with this figure. 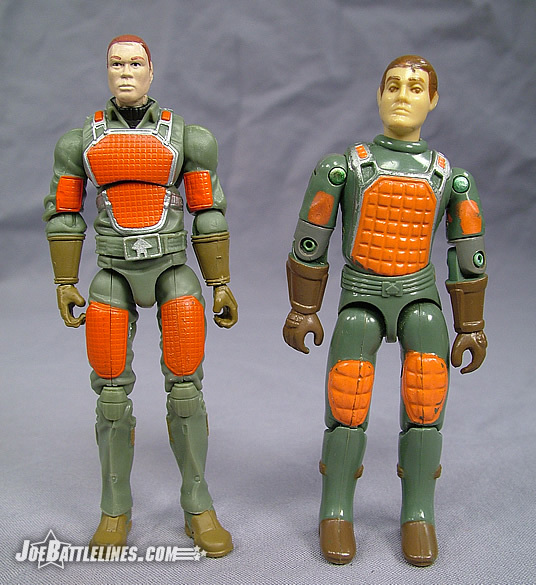 Flash was one of the first Joes I ever owned as a young Joe fan. (The distinction of being ‘first” goes to Clutch!) Yet I can appreciate that Hasbro has taken an extremely dated character design and produced a figure that is still visually exciting today. With fixed articulation in the waist and a greater range of motion in the elbows (although still not perfect), Flash can hold his head high as an example of how to properly update a classic character so that the design holds appeal to fans both new and old. 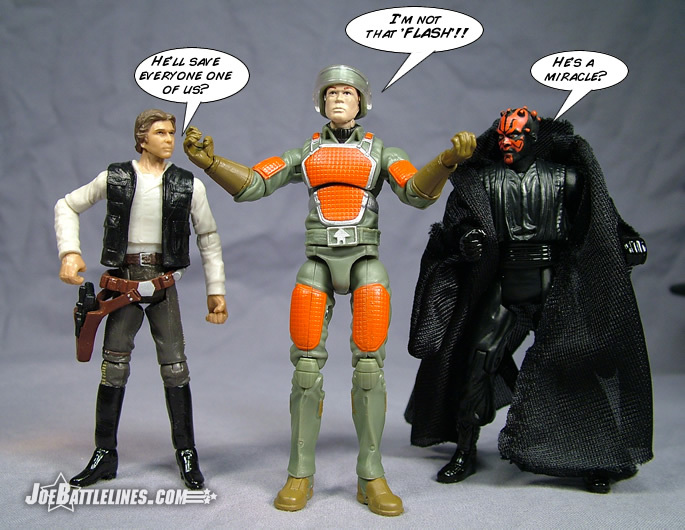 I applaud Hasbro for not only sticking with the classic character design but also for including the character in the anniversary line in the first place. Who knows whether or not all of the “original 13” will eventually see release in this new line? I suspect that someone at Hasbro is taking advantage of every opportunity possible to find new way to work the members of the debut roster into the production line-ups and I think them for it. Flash is quite possibly my favorite figure of this wave, second only to the truly phenomenal “Iron Grenadier Leader” we all know as “Destro”. 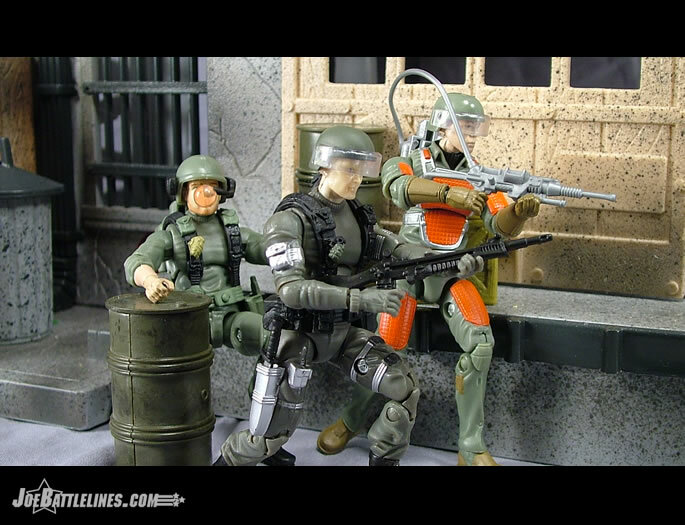 This is one of those “must have” figures and I encourage everyone who hasn’t already acquired Specialist Gambello aka “Sgt. Flash” to add him to their collections today!